This summer we have been reading stories in the Gospel in which people have a close encounter with Jesus, a significant experience that leaves them forever changed. The hope is that by reading these stories, we too will encounter Jesus and be changed for good. The two stories read today appear one after the other in John’s Gospel. Usually they are treated as separate readings in separate sermons. But, when I considered these two stories together, I realized that these two encounters Jesus had with two very different people reveal one powerful message and invitation for us. The two characters in these stories could not be more different. Nicodemus is a Jew, a member of the Jewish ruling council. Nicodemus is a respected moral leader in his community, a devout and upstanding Pharisee. The woman has a shameful past--having five different husbands was not acceptable. Nicodemus has a name. The woman is not named. Nicodemus is the consummate insider. The Samaritan woman is an outsider. And yet, they each have a personal encounter with Jesus; and one person leaves changed for good. Nicodemus goes at night to Jesus. At night it is dark and this is significant in Gospel of John. It symbolizes the unknown, that which is hidden. Perhaps Nicodemus does not want anyone to see that he does not know it all, that he is seeking something, perhaps the secret of finding peace with God and himself. Jesus poses the final question with judgment: Are you a teacher of Israel and do not understand these things? The dialogue with Nicodemus is not just conversational. In John’s gospel, an encounter with Jesus is the salvific moment. Jesus offers Nicodemus peace in this world and the next. Salvation is received by grace alone. You can’t earn it with you titles, you can’t buy it with your money. You can’t get it for being good. You can’t reason it or understand it. You can’t control it or decide who gets it. You don’t get it by being an insider. It is a gift you can only get by being born again--by admitting your need and having faith in God to save you. The question is if Nicodemus will be open to simply receive the gift through faith. He is not. So, Jesus moves on to a Samaritan city. He sits down by the well. It is daytime, where all can be seen and nothing can be hidden. He sees a Samaritan woman come to the well. He asks her for a drink. Jesus is offering her something as basic and necessary to her spiritually as water is to her physically. A spring of water is akin to a deep satisfaction and contentment that doesn’t run out, a joy that doesn’t depend on what is happening outside of us. Jesus knows that nothing outside can satisfy the deep thirst inside us, the deep longing to find peace with God and with oneself. A few years after delivering this speech, Wallace committed suicide. He rightly identified the problem--human’s emptiness and search for meaning--but he could not find the answer of how to fill up his emptiness. These two encounters Jesus had with two very different people reveal one powerful message: Both are equal sinners in need of grace. Insiders think morality and accomplishments will save them. Outsiders turn to money and power to save them. Nicodemus is no different than the homeless man, the drug addict, the criminal, and the Samaritan woman, they all have to realize that they cannot fill their deep void or satisfy their soul’s thirst; in essence, they cannot save themselves. In the encounter, Jesus helps her realize her spiritual need and deep thirst as well as the only way to fill it and satisfy it. In Keller’s words, Jesus promises her: “I can give it. I can put it into you. I can give you absolute, satisfaction in the core of your being regardless of what happens outside, regardless of circumstance.” (K, 27). Come and see. Jesus is offering grace--a free gift for us all. Jesus is offering salvation. 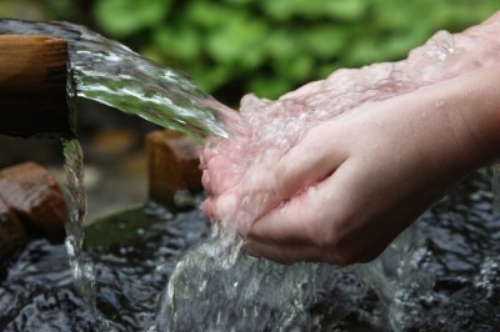 Jesus is offering us something to fill our emptiness--not something that comes from outside, but inside, a spring of living water so that we will never be thirsty. Jesus is offering what we all need most of all--peace with God and with ourselves--deep peace, the peace the world cannot give, the peace we only find in Jesus Christ. Feeling lost? Come and see Jesus the way. Feeling thirsty? Come and taste living water. Feeling empty? Come and let Jesus fill you up until your cup overflows with joy and contentment and peace. Feeling outside the arms of grace? Come and know the truth of God’s love that came to save the whole world, one grace-soaked soul at a time.